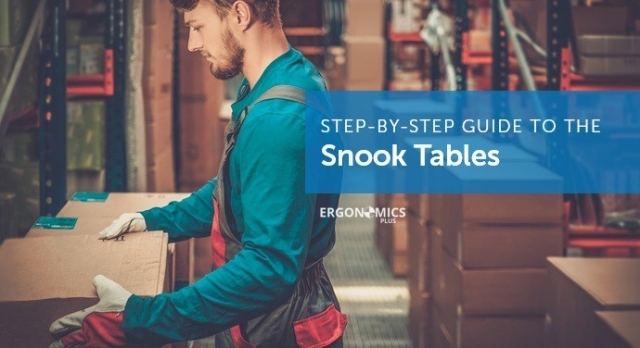 What is a "Snook Table"? The Liberty Mutual MMH Tables (commonly known as "Snook Tables") outline design goals for various lifting, lowering, pushing, pulling, and carrying tasks based on research by Dr. Stover Snook and Dr. Vincent Ciriello at the Liberty Mutual Research Institute for Safety. The tables provide weight/force values, for specific types of job tasks that are deemed to be acceptable to a defined percentage of the population. This is accomplished by comparing data for each of the specific manual handling tasks against the appropriate table. Click Here to check out this great article by ErgonomicsPlus! See how Human Hoist can help you or your organization! Or give us a shout at 989-843-8020 today!